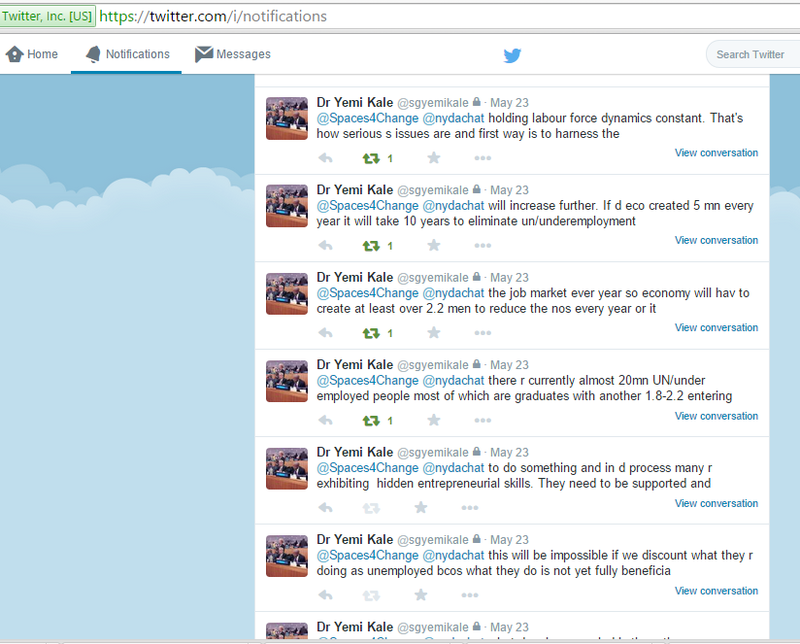 In a spontaneous Question and Answer (Q & A) policy dialogue on Twitter, Dr. Yemi Kale, the statistician General of the Federation fielded questions from members of Spaces for Change network comprising mainly young Nigerians reacting to the National Bureau of Statistics’ recent review of its methodology for calculating the unemployment rate in Nigeria. The revised methodology downsized the indicator for calculating unemployment rate from 40 hours to 20 hours a week. The new regime recognizes the labour contributions of both skilled and unskilled workers based on the number of hours they put in, This review saw the unemployment rate crashing down from 23% to 6%, generating diverse reactions from a broad spectrum of Nigerians. 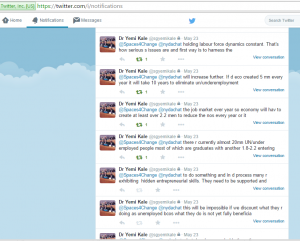 Dominating the tweet-chat were questions interrogating the rationale behind the job redefinition formula and the impact the downscaled figures would have on the soaring unemployment rate in Nigeria. Dr. Kale explained that “we need to know how many are unemployed and underemployed. How many are in seasonal, venerable and structural employment. The new definition of employment doesn’t take your income or qualifications into account. Some have argued that a taxi driver is only employed if his skills and qualifications are in line with what they perceive as basic requirements required being a taxi driver. I’m sorry to say that taxi driving is a job regardless of who is doing it. However when a Ph.D holder driver does it, he is underemployed because he is doing something not commensurate with his skills. So, we will classify him as employed, but underemployed. This sends a message to policy makers they have to create a better job for him while freeing what he is doing to an unemployed man who fits the skills of a taxi driver. This is more useful than emotionally dismissing him as unemployed and ignoring that that vacancy exists. Another concern is that we tend to belittle certain activities and say they are not jobs based on sentiments. Oh she is a nanny, oh he is a security guard, oh he is a barber. Is that a job? Do we realise that in many advanced countries such professions are highly regarded and people earn a huge living from then.